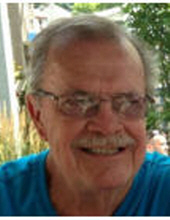 James A. O’Connell, a lifelong resident of Toledo’s Point Place Community, passed away Wednesday October 24, 2018. He was born on January 5 in Toledo to George and Kathryn (Tolles) O’Connell. James graduated from Waite High School where he met & married Diane Nero. He was employed in the steel fabricating business as a sales engineer working at Katy Steel then on to Tech Dynamics where he later retired. He enjoyed working with his coworkers and professional contacts on every project. He was an avid boater growing up around Lake Erie. James was a lifetime member of Riverview Yacht Club and earlier on was involved in the Toledo Power Squadron. He visited many ports on the lake and loved the friendships of his fellow boaters. James had a passion for hockey. It began as he played in high school and continued into coaching his son’s teams. He helped develop the TOYHA Hockey League for young athletes in Toledo. Everyone knew when the Red Wings played, everything else stopped. James is survived by his wife, Diane O’Connell; daughters, Kimberly Madison and Lisa (Daniel) Giesler; son Brian O’Connell; grandchildren, Jacob and Lucas Madison, Kyle and David Giesler, Paige (Sean) Cohen, Amber O’Connell, and great-granddaughter Aurora; brother Robert E. O’Connell; canine companions Snickers & Sophie; and numerous nieces and nephews. He was preceded in death by his parents and brother, George (Cecil) O’Connell. We would like to thank Erica and Vonetta from Promedica Hospice, The Guardian Angels, Toledo Fire & Rescue from Station 24, Cal, and the countless caregivers, friends, and family members that made his life more comfortable. To send flowers or a remembrance gift to the family of James A. O'Connell, please visit our Tribute Store. "Email Address" would like to share the life celebration of James A. O'Connell. Click on the "link" to go to share a favorite memory or leave a condolence message for the family.